What’s Next for Paid Search? Is it possible that in the near future mobile searches will become more popular than searches performed on a laptop or destop? With the expanding amount of mobile smartphones coming into the market that have web browsers with full HTML display capabilities, it is definitely a possibility. According to an interview with Frankfurter Allgemeine Zeitung, Google CEO Eric Schmidt predicts that within a few years, mobile advertising would generate more revenue than advertising on today’s web. While the iPhone was one of the first mobile devices to come out with a HTML web browser capable of displaying an entire paid search ad, more devices are set to come into the market. Knowing that mobile search is becoming more popular, our team began participating in Google Adwords iPhone beta, which in a 12 week period has already provided us with some insights on mobile trends. First, we have seen the popularity of iPhone searching increasing. For one of our clients,every two weeks we have seen a trend of visitors to our client’s site through their mobile devices with HTML capability almost doubling. Website visitors using iPhone beta increased 73% since the test began. Second, we found that the Click Through Rate of people searching on their iPhone is more than double the percentage of the account’s average. We can conclude that people searching on their iPhone have an increased likeliness to click on our ads based on instant gratification, meaning that mobile searchers are motivated and they want to fill an immediate need/want. Third, we were expecting ROI to increase through the mobile device based on the findings above. We anticipated the more tech-saavy customer to be comfortable transacting in this environment.. This was not the case, however. Conversion rate from iPhone traffic lagged our client’s benchmarks. 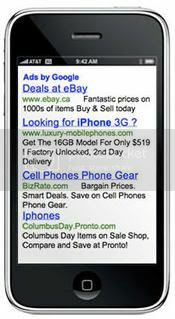 Perhaps mobile searches don’t want to make big purchases on the go but instead want to focus on quick research. With the results we have found with the iPhone Beta so far, and growth in popularity of mobile in general, I believe that mobile search is going to begin to be a trend we see all paid search advertisers particpating in. As in mobile search usage increases, marketers will need to adjust landing pages and make their sites mobile-friendly to improve the conversions.. Just like with any other platform, the best rule of thumb is to test, test, and test some more. Haley, very interesting results! Thanks for sharing. The high CTR is common for mobile devices, but I would look into the lower conversion rate. It could be that the desktop version of the site isn't allowing a user to convert, or that the mobile site isn't optimized for their device. As you say, test test test. Glad to see you're learning from your experimentation though.